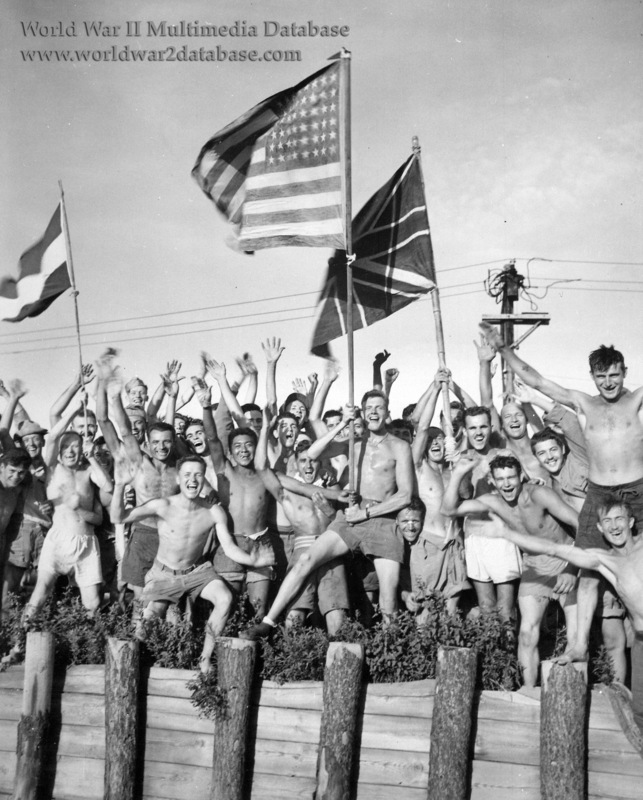 Allied prisoners of war cheer their rescuers, as the US Navy arrives at the Omori prison camp on August 29, 1945. They are waving the flags of the United States, Great Britain and The Netherlands. Electrician's Mate 2nd Class James D. Landrum holds the American flag. Captured after the sinking of USS Grenadier (SS-210) in the Lem Voalan Strait, Indian Ocean, by scuttling after Japanese air attack on April 22, 1943. 61 officers and men were rescued, including Landrum. Landrum experienced torture (bamboo under fingernails), starvation (beriberi contributed to his death in 1980) and barbaric medical procedures (a Japanese doctor botched his appendectomy, causing massive bleeding and infection.) Four men from Grenadier died during their incarceration. Omori held prisoners such as Gregory Boyington, the top scoring Marine ace; submarine commander Richard "Killer" O'Kane; and B-29 bombardier/navigator Raymond "Hap" Halloran (who was on the dock with Landrum, but not pictured). All became successful authors after the war, writing about their wartime exploits. Boyington and O'Kane won the Medal of Honor.